The California Office of Traffic Safety client account has kept Team PC busy (And on the road!) this past spring. While we love all of the work that we do, we particularly love that each OTS campaign allows us to tap into our creativity, bring a new concept to life, and embark on another adventure of sharing some very important messaging with the public. 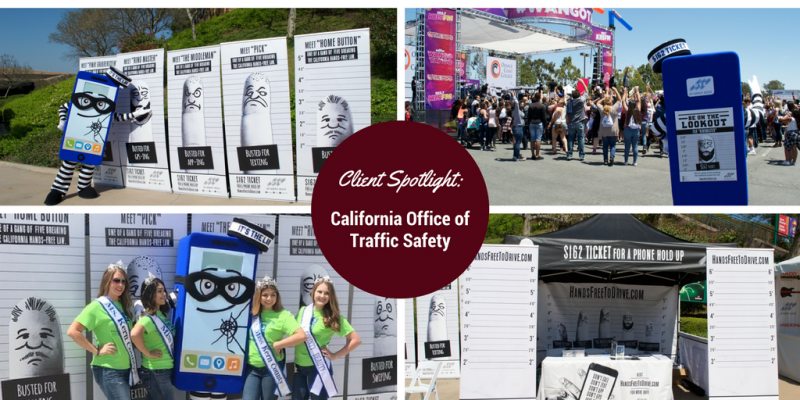 This year, the team strived to educate California drivers on OTS’ new distracted driving campaign. We focused on a fun, new concept featuring the “Gang of Five” – five finger characters who are “busted” for texting, calling, app-ing, gps-ing, and swiping. Along with the “Gang of Five”, the campaign’s new cell phone mascot, “Celly”, played a major role in campaign messaging and community outreach events. Alongside our campaign partner, iHeart Media, we made our way throughout the state, hosting interactive and informative booths at several major events across California. At each event, attendees had the opportunity to learn about the campaign message, pose for distracted driving “mugshots”, interact with “Celly” and be entered to win a concert giveaway package, courtesy of iHeart Media. Those that visited the booth also received campaign-themed materials, including branded phone mounts, photo holders, tip cards, bookmarks and posters. If you were lucky, you may have spotted some of the PC team at one of the many events we attended! We had the pleasure of hosting a booth at the SPCA Doggie Dash in Sacramento, the Rodeo Kick-off Concert in Fresno, the Green Expo in Bakersfield, the Monster Truck Series in Salinas, San Diego’s Summer Concert Kick-off Series, and Los Angeles’ Wango Tango concert. Take a look at the photos above for a glimpse of some of the fun we had. We can’t wait to see what the next campaign has in store!